The Sir David Akers Jones Hong Kong and China Fund is awarded to two students who wish to study at one of The University of Kent’s partner institutions, or undertake a work placement, in Hong Kong or mainland China. Be enrolled on a full-time degree level programme at the University of Kent that incorporates a study or work placement abroad in Hong Kong or mainland China. Undergraduate students must be entering into their second year of study in 2018-19, and have achieved a first year average of an upper second or above. ​Postgraduate students must be entering into their first year of study in 2018-19. If you are interested in this opportunity, then you must submit your application by no later that 31 January 2019. This year the Careers and Employability Service, in conjunction with the Dean for Internationalisation, has offered 3 bursaries of £2000 to students wishing to undertake a 1 month summer internship experience in Beijing with CRCC Asia, starting 20 July 2017. In addition to the internship, pre-departure language and culture training opportunities have been provided through the Centre for English and World Languages. We are looking for fun, fresh short films that celebrate why it is great to study abroad in Europe. Making friends from different countries… introduce us to some of the international friends you have met and tell us why they are so important to you. Training for your perfect career… how is studying in Europe helping you achieve your aspirations? What experiences have you had that will help you in the future? Discovering new cultures… show us how passionate you are about meeting new people and learning about the different cultures across Europe. Enjoying new hobbies and interests…. Tell us about your new interests you have developed and how they have added to your experience of living in Europe. Student life… explain to us what student life is like for you. Do you have any top tips for students thinking about coming to study in Europe? We plan to select and publish between 10 and 30 films. Each film we publish will receive a prize of a voucher to the value of 150 Euro. The Deutsche Bank Creative Awards is a national Awards scheme for final year creative students and first year graduates, it aims to support creative graduates starting their career, those setting up their first business or starting out as a creative practitioner with their first not-for-profit initiative. This Award is open to all Final Year BA or MA creative degree students or recent graduates (after April 2016). Are you thinking about staying with us for postgraduate study? 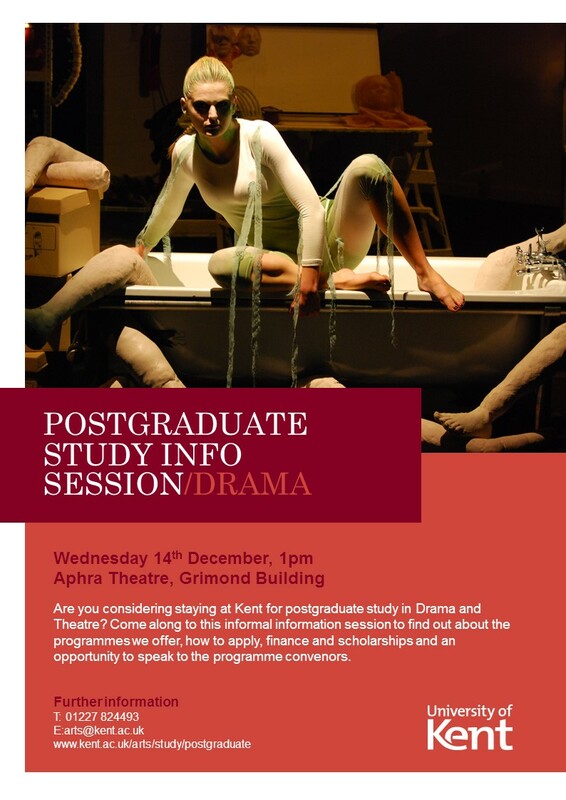 Then make sure you come along to our information session on Wednesday 14th December at 1pm in the Aphra Theatre! Here you will find out all about our postgraduate programmes, application process and funding. Postgraduates from institutions throughout the EU are invited to submit projects that exhibit formal or creative daring. These might include creative writing (up to 2000 words), images, films (up to 15 minutes), digital artefacts, performances, or musical compositions. The prize is a collaboration between the Centre for Modern Literature and Culture at King’s College London and Cove Park, Scotland’s International Artist Residency Centre. Winners receive £1000 and spend the first two weeks of September at Cove Park, engaging in a residency and showcase. All shortlisted works are given a public performance at the prize-giving and are written up in the journal Textual Practice. The prize will judged by Lisa Appignanesi, Michael Berkeley, Rachel Cusk, Dexter Dalwood, Julian Forrester, Jeremy Harding, Deborah Levy, Stephen Romer, and Fiona Shaw. The deadline for the prize is Friday 31 March 2017. Entries should be submitted to modern@kcl.ac.uk (or posted to Dr Lara Feigel, Director of the Centre for Modern Literature and Culture, English Department, 22 Kingsway, London, WC2B 6LE). You are also warmly invited to our prize launch on Wed 16 November at 6.30pm at King’s College London. How important or possible is it for the contemporary artist or writer to keep breaking formal boundaries? Is this compatible with the demands of the marketplace and how does this differ in the art world and the literary world? How can we recognise the new when we are necessarily steeped in the old? Here acclaimed artist Dexter Dalwood and writer Eimear McBride will explore these questions in a discussion that launches the 2017 Ivan Juritz Prize. Please see www.ivanjuritzprize.co.uk for more details about the prize and the Centre, and for details of the November event.